Three decades after rolling out the first Legacy, an all-new model launches this midsize sedan’s fourth decade. This month, the 2020 Legacy rolled out at the 2019 Chicago Auto Show, which is just 125 miles from where it will be built at a Lafayette, Indiana, manufacturing plant. 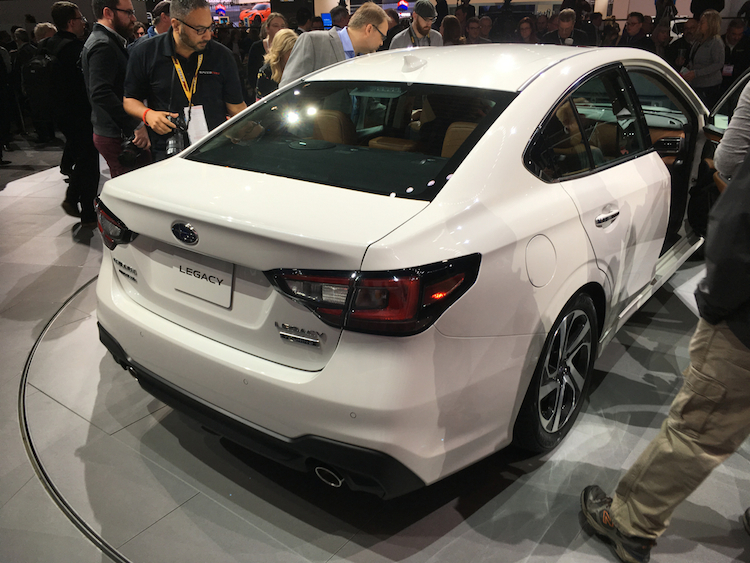 The 2020 Subaru Legacy makes its Chicago Auto Show debut. 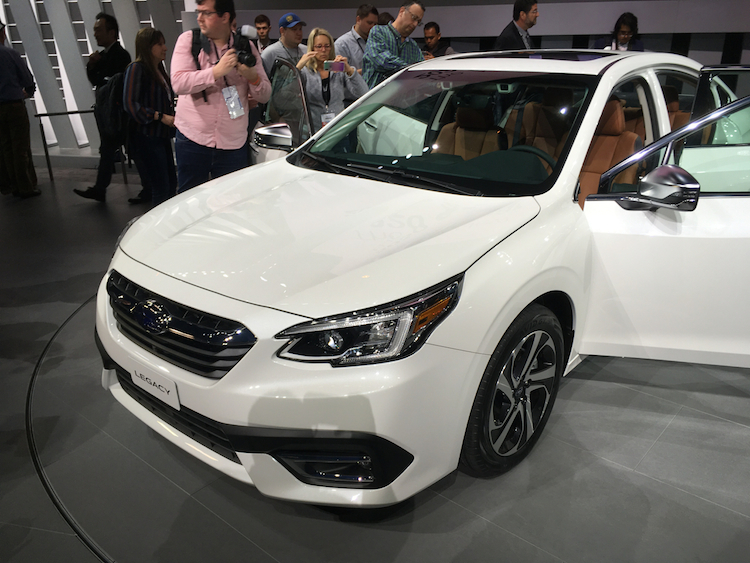 The seventh-generation Legacy’s introduction comes as the market for midsize sedans continues to shrink. In fact, a number of competitors have left or are leaving the segment, including the Chrysler 200, Dodge Avenger, Mitsubishi Galant, and soon the Ford Fusion. Consumers want crossovers, models already popular with Subaru. That said, this maker of mostly all-wheel-drive vehicles still sees life in the segment. Besides fewer competitors going forward, what is also helping Subaru is sharing its vehicle architecture across more model lines. Indeed, the 2020 Legacy rides on the Subaru Global Platform, which in 70-percent stiffer torsional and front-suspension rigidity as well as 100-percent stiffer lateral flexural and rear subframe rigidity. Further, Subaru increased structural adhesiveness nearly four-fold. In all, the new model demonstrates gains that will improve crashworthiness, offer improved handling, and deliver a smoother and quieter ride. 1. Six trims for the choosing. You’ll find Base, Premium, Sport, Limited, Limited XT and Touring XT trims when the 2020 Legacy rolls out this fall. Every model features standard all-wheel drive, the only model in this segment that can make this claim. In fact, all-wheel drive is available on only two other models: the Ford Fusion Sport and the Nissan Altima. 2. Two engine choices, including a turbo. Returning for 2020 is a 2.4-liter Boxer four-cylinder engine. It has been upgraded to produce 182 horsepower and 176 pound-feet of torque, numbers which should be adequate for most drivers. But most drivers aren’t the ones drawn to the previously available V6, which has been discontinued. In its place is a turbocharged 2.4-liter Boxer four-cylinder engine with an output of 260 horsepower and 277 pound-feet of torque. Those numbers beat the V6’s 256 horsepower and 247 pound-feet of torque. Both of the 2020 engines work with a continuously variable transmission. 3. Improved tech features. What’s a new model without improved tech features? The Subaru Legacy delivers with its new 11.6-inch display screen, a tablet-like device that is sure to please. Subaru integrates its communication system with Starlink technology, which supplies Apple CarPlay and Google Android Auto smartphone compatibility on its screen. That screen also controls other functions, include climate and audio. Navigation is also available and is powered by TomTom. Wi-Fi connectivity is another available feature. 4. More premium touches. 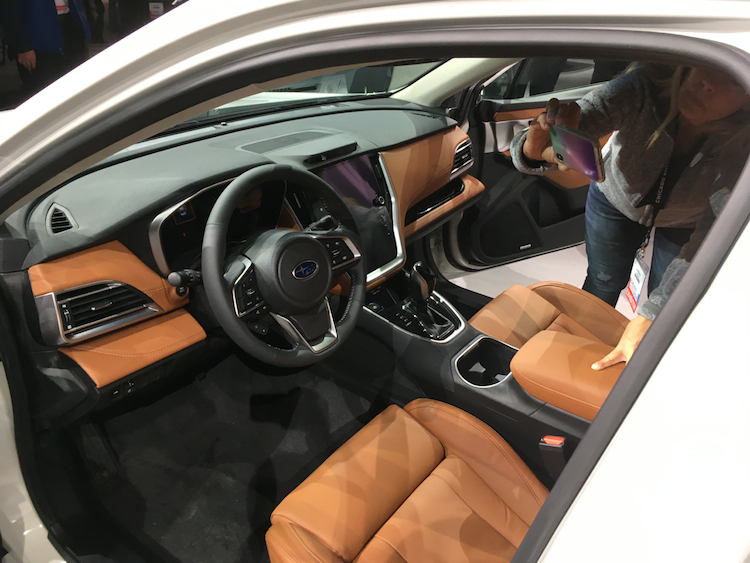 The auto show display model revealed just how upscale a Legacy can be. It is as if Subaru raised the look to offer a bridge between luxury and mainstream, a trend we’ve seen in models such as the Toyota Camry and Nissan Altima. For instance, the Touring trim is outfitted with genuine Nappa leather, which delivers a luxurious look and the comfort to go with it. The interior roof pillars are wrapped in high-gloss black molding and chrome plating dresses the door handles. The Sport edition has aluminum pedals and red stitching on the instrument panel. 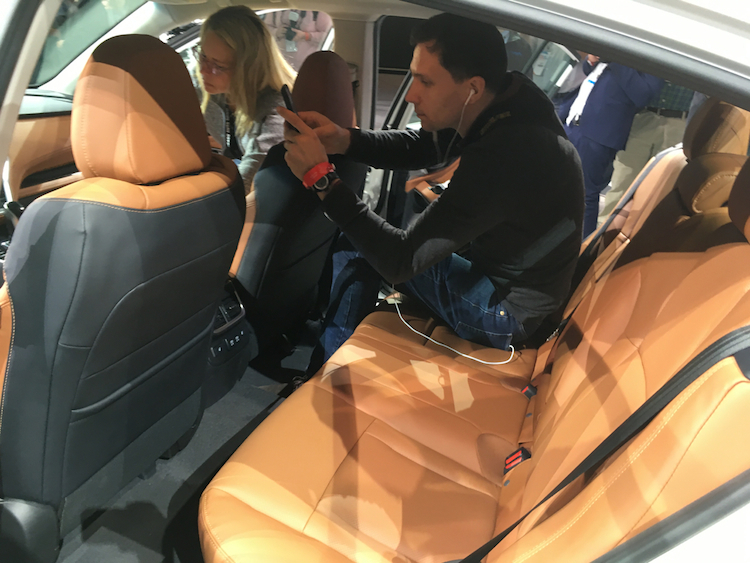 Other changes include three levels of heating for the available heated front seats. 5. Safety enhancements galore. You’d expect Subaru to defend its top-tier safety rating when designing a new Legacy. The new model does just that. New this year is a Front View Monitor, which captures images within the driver’s blind spot and displays a 180-degree view on the color display. This is helpful for pedestrian detection and parking. Other driver-assist features include LED steering responsive headlamps on the Limited and Touring trims, reverse automatic braking, and blind spot detection with lane change assist and rear cross traffic alert. There are a few things about the 2020 Legacy that aren’t yet known. It appears slightly larger than the outgoing model, but we weren’t supplied with model specifications, including wheelbase and overall length. It does, however, sit slightly lower to the ground and that’s no small feat for an all-wheel-drive sedan. Pricing won’t be announced until nearer this vehicle’s release date. We could see a slight boost in cost for the base model, with larger increases at the top of the model range. Whatever became of the Infiniti QX50, Nissan’s luxury brand’s sporty, compact SUV? After a 10-year run under various naming conventions, the QX50 disappeared. But not for long. 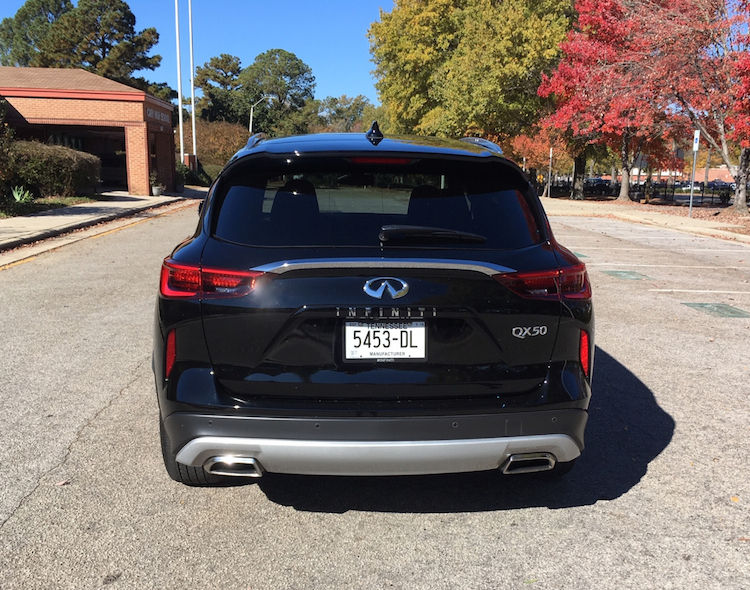 Indeed, after a one-year hiatus, the QX50 is back, an all-new model that’s quite different from the original. That newness is immediately evident in a vehicle that has a fresh, modern exterior and the latest interior design. Most significantly, however, is what’s powering this model: gone is the burly V6 riding on rear-wheel-drive architecture. In its place is a front-wheel-drive model with available all-wheel drive and motivated by an unusual turbocharged four-cylinder engine. 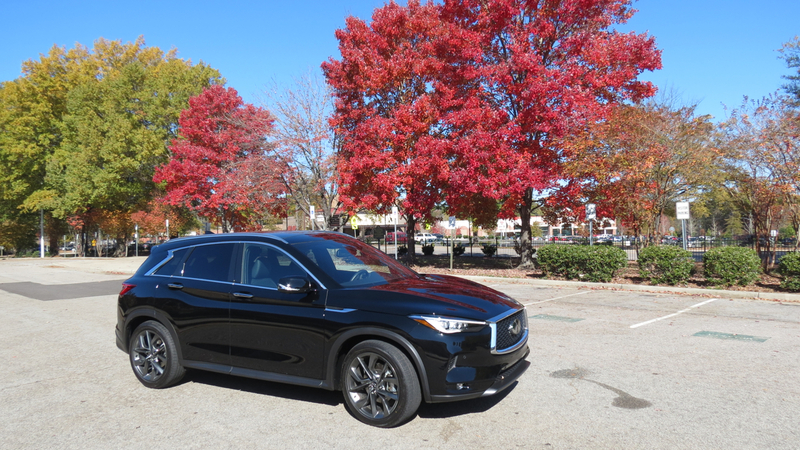 Infiniti offers the 2019 QX50 in three trims: Pure ($36,550), Luxe ($39,400), and Essential ($43,350) trims. Add $995 for the destination charge. Choose all-wheel drive and your cost rises by $1,800. Package options are thin with the first two trims, but generous on the Essential. 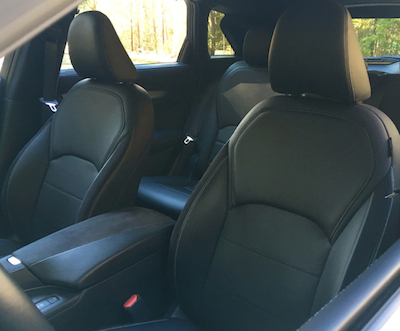 There are no packages with the Pure trim, while the Luxe offers just one: heated front seats ($550). Choose the Essential and you’ll find a Premium Audio Package ($900, 17-speaker Bose audio system with a subwoofer and rear door tweeters); ProAssist Package ($550, backup collision intervention, distance control assist, intelligent (adaptive) cruise control, rear cross-traffic alert); Proactive Package ($2,000, ProPilot Assist, blind spot intervention, lane departure warning, lane departure prevention, high beam assist, head-up display, direct adaptive steering, park with easy steering). You’ll also find a Premium Heat Package ($1,200, heated front seats, seat memory system, side mirrors with reverse tilt-down, power tilt-and-telescopic steering column); Sensory Package ($7,500, includes features from Premium Audio and Premium Heat packages along with advanced climate control, 20-inch dark painted aluminum alloy wheels; upgraded leather seats, wood trim, motion activated liftgate, adaptive front lighting, ambient lighting, passenger power lumbar support, rear side window sunshades); and an Autograph Package ($2,500, white semi-aniline leather-appointed seating, center console accents, seat quilting stitching, blue piping). Lastly, is a Tow Package ($900, tow hitch and wiring harness, oil cooler and radiator, enabling this SUV to pull up to 3,000 pounds). With a few choice accessories added, your final cost can top $60,000. That’s a lot to pay for this model, so choose your options carefully. Infiniti’s design language is fetching, as we’re drawn to several elements that stand out. From its double-arch grille, gently rising beltline with a zig-zag rear roof pillar to various bulges, creases and attention-getting elements on the hood, corner panels and rear quarter, there is much to take in. But none of it is overwhelming — it simply seems very right and it looks great! The standard exterior features include LED headlights, daytime running lights, and taillights. Power-folding side mirrors, 19-inch aluminum-alloy wheels, and a power liftgate, are also included. Move up through the trims and you’ll find such features as adaptive front lights, automatic high beam control, and 20-inch painted aluminum wheels. Inside, Infiniti’s designers pulled out all the stops, delivering a cabin that ranks among the best. In some ways, this isn’t surprising as Infiniti generally delivers lovely interiors. But the current-generation QX50 is clearly head and shoulders above the previous model in this department. The top trim features choice leathers with diamond quilting, along with wood touches and a suede headliner. 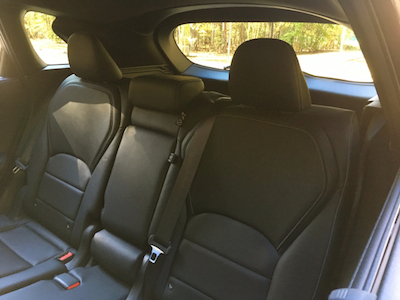 The front seats are quite comfortable, striking an ideal balance between support and relaxation. Happily, the QX50’s interior isn’t cluttered or distracting. Infiniti found an ideal way to present everything with clear dials, an unencumbered center stack, and the features we want. Seating is for five and five can fit quite well. Among the standard items are imitation leather seats, aluminum trim, a power driver’s seat, and split-folding rear seat with recline, full power accessories, a tilt-and-telescopic steering column, and dual-zone climate control. Options include leather seats, heated and cooled front seats, three-zone climate control, and trim upgrades. We don’t have crash test data available yet from the Insurance Institute for Highway Safety (IIHS), nor has the National Highway Traffic Safety Administration (NHTSA) supplied its own ruling. Nevertheless, we’re confident the QX50 has many of the features we want and we expect it will support a strong rating from both agencies. All models come with forward collision warning and forward emergency braking with pedestrian detection. These are features we expect in new cars, although they’re not always standard. Blind-spot warning is standard beginning with the Luxe trim. But other features are available and only with a package upgrade exclusive to the top trim. These include lane departure warning and prevention, lane keep assist, rear cross-traffic alert, backup collision intervention, and adaptive cruise control. You’ll also find ProPilot Assist, which supplies a foundation for autonomous drive. Our only comment about the QX50’s safety features is that we wish these were available across the model line. 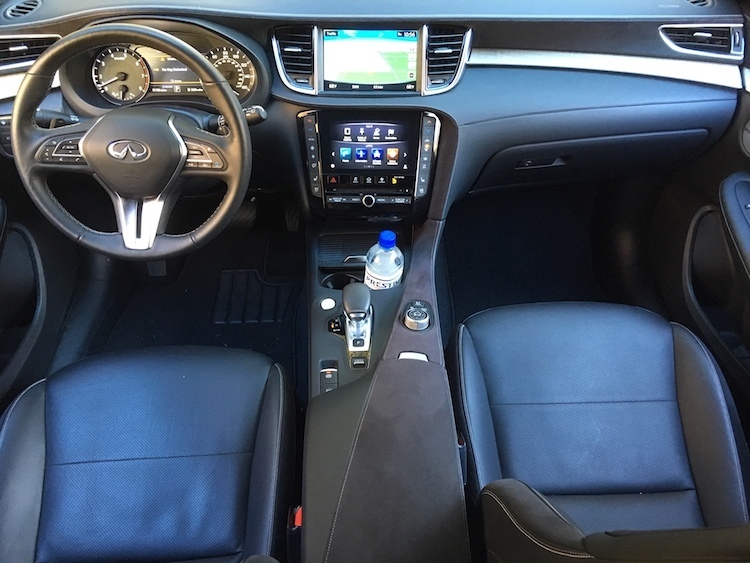 On the tech front, Infiniti supplies the 2019 QX50 with a six-speaker audio system, Bluetooth, satellite radio, and USB connection. The available 16-speaker Bose audio system delivers the pristine sound we like in our luxury models, but it is only available as part of an option package with the top-trim Essential model. The big news for Infiniti this year is the turbocharged 2.0-liter four-cylinder engine powering the 2019 QX50. It is a surprise hit among engines this year, thanks in large part to its innovative variable compression. It employs technology that shortens the length of the piston-stroke, changing the compression ratio from 14.0:1 to 8.0:1, on demand and while the engine runs at full speed. This means when you press down for full acceleration, the engine returns optimum power on demand. Its overall power equals that of some previous-generation V8 engines, while delivering the efficiencies we expect in a small crossover. Although we very much like the new engine, the continuously variable transmission leaves us scratching our heads. This gearless automatic transmission certainly contributes to the model’s excellent fuel economy, but it is noticeably different from the previous seven-speed automatic we’re accustomed to. You’ll find ample low-end power, but then as you increase your speed, the full benefit of the power curve isn’t there. Allow me to say this: the perceived slight in power won’t matter to most drivers, except for enthusiasts and the more attentive of the previous EX/QX50 owners who valued the earlier drivetrain. Infiniti elected to go with the most efficient combination and the payoff is a stellar 31 mpg on the highway. As for steering and handling, we find the steering a bit quick to respond, while its handling settles in by delivering the control you expect. Benefiting this SUV is its slightly wider and taller stance, which provides improved balance and control, especially on back roads. This SUV delivers confident braking that equals what competing brands have. 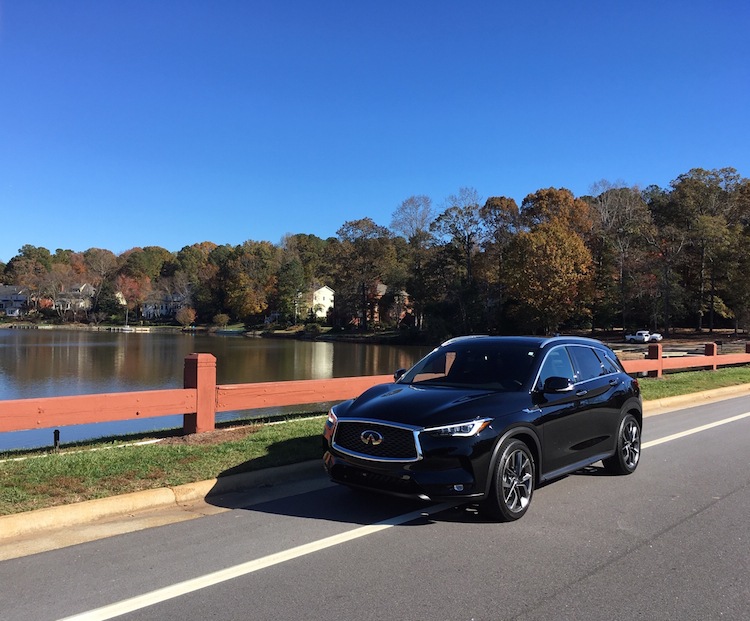 The all-new Infiniti QX50 is a winner for the brand and for the customers who buy one. Its style and comfort are its two strongest suits, although the engine merits much praise as well. If there is a weakness beyond the CVT, it would be the way Infiniti packages its advanced driver-assist features. Again, we think offering them across the board would be smart move on this marque’s part. 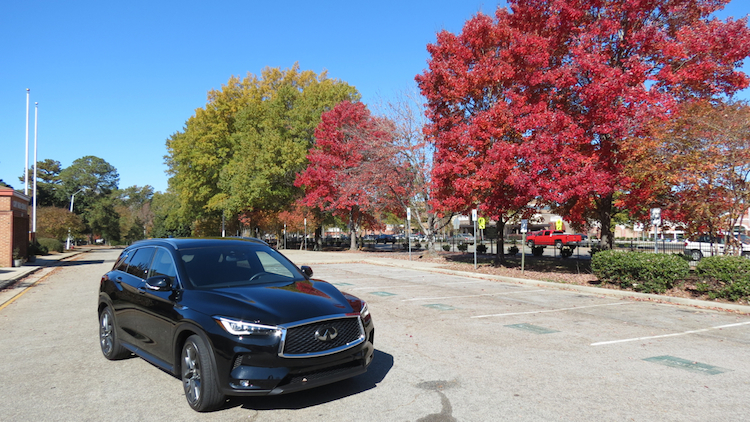 The competition in this segment is very strong and represents the entry-point for many consumers who might have once preferred a coupe like the Q60 or a sedan such as the Q50. We’ve covered both models and are happy to recommend this duo to our readers. That said, the Infiniti’s competition comes from such models as the Mercedes-Benz GLC, Cadillac XT4, Audi Q5, Acura RDX and the Lexus NX, to name a few. All models have a sub-$40,000 price point, an important criteria for any vehicle in this segment.